WOW! Billboard wasn’t lying when they said they’d get us get as close to the music as possible. After 11 dedicated years and too many shows to count, I can honestly say that I’ve never been as close to DMB as I was tonight at Toyota Park. THANK YOU, BILLBOARD! While I usually don’t love stadium shows because of their lack of intimacy, tonight I felt like I was getting my own private show…at least for the first 3 songs, that is. Hey, a girl can dream, can’t she!?!? Forget trying to squeeze and sneak my way up to the front….in an arena filled with 28,000 people, I was literally (and legitimately, for once) the closest one to the stage. Looking back over the sea of fans was a surreal experience, to say the least. With strict “no video or camera” rules in effect, only myself and two professional photographers were granted access to the press pit. Intimidating? Just a bit! Whatever…I was too excited to let my insecurities take over. However, while my two “co-workers” for the night set up shop, I was hesitant to block the views of the front row fans behind me (talk about an oxymoron)! My giddiness must have been contagious though, because instead of being disgruntled by having to stare at my back rather than Dave’s face, if only but temporarily, they fully supported my cause. 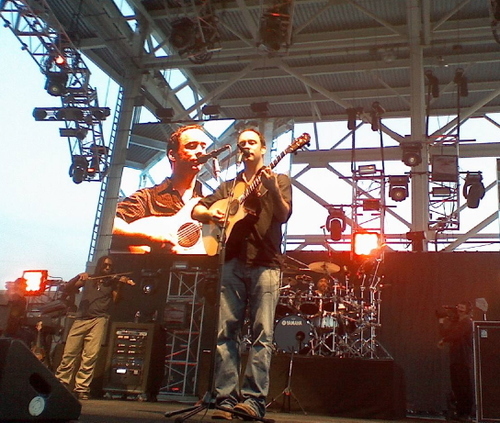 As I always say, DMB fans are the best! So with their go-ahead, along with yells from my cheering section a few rows back (thanks Frank, Celeste, Reid and Vanessa), I perched myself up on the guardrail between the front row and the stage, pinched myself a few times, and waited for my all time favorite band to take the stage. I think I’m still shaking! As if I wasn’t already “on cloud 9,” as the security guard next to me laughingly pointed out, hearing the intro to “One Sweet World” completely epitomized the moment for me. For as cheesy as it sounds, I really was in my own sweet world for the time being, (and congrats to Debbie for calling it)! 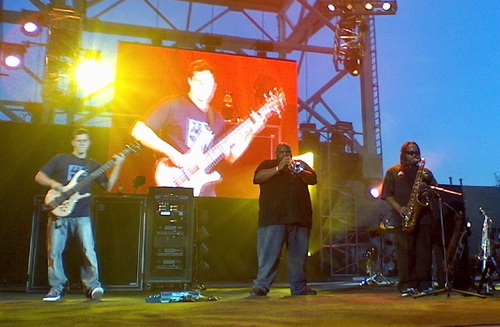 Though many die hard DMB fans are ready for the band to bust out with a different opener, especially those of us who probably heard it one too many times last summer, it really is the perfect way to start a summer show. The light, happy groove immediately puts a smile on your face, gets you dancing and sets the tone for a great night of music and fun. “You Might Die Trying” aptly followed—keeping with the theme of trying "to save the world,” perhaps left over from the band’s Live Earth performance the night before. This more recent tune off of Stand Up has definitely grown on me, and watching LeRoi Moore and Rashawn Ross blow out the horns right in front of me helped me appreciate it even more. Ok, so sadly my 3rd and final song was quickly approaching. I prayed for ANYTHING that allowed for an extended jam—would have taken a 20 minute “Jimi Thing” at that point, even though I knew it was way too early in the show for that—just to selfishly prolong my stay up front. But no such luck. As a cover of Daniel Lanois’ “Still Water” began, I knew “Don’t Drink The Water” was inevitably up next. One of the best parts of a DMB show is seeing (and hearing) how intensely Dave can get into a song, and “DDTW” is a great example of this. Though the song starts out nice and easy, it eventually escalates into an “Angry Dave” belting out the lyrics with mouth wide open, face turning a slight shade of red, forehead vein bulging and legs shuffling back and forth. It’s a sight to behold, and as such, I had to put down my LG to fully take in the moment. And then my time was up (sad face). I very politely informed my security guard friend that I wasn’t going to leave, but as he tilted his head sympathetically (as if to say, “I’d let you stay if I could”), I obediently stepped down from my station on the railing and floated back to my “regular” seat. It’s incredible to me that after following DMB for so many years, there are still those stand-out moments at each show that remind me of exactly why I love this band so much. 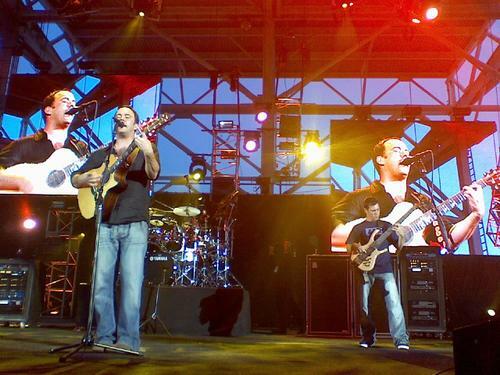 When DMB is “on,” and the guys are doing their thing…singing, jamming, dancing, laughing and just totally feeling the music…there is no live band that does it better. Tonight’s show in Chicago was no exception. Though I’ll admit that, as a whole, tonight’s set list didn’t THRILL me, there were certainly highlights. “Grey Street" is always a fun, high-energy live song, and I was psyched to hear “Idea Of You,” my favorite new song that gets better every time they play it (and cracked up when Dave revealed it was about his babysitter). Like many other fans I spoke to though, the show didn’t truly pique for me until “Seek Up.” After a few too many slow songs in a row (aka “Falling Off The Roof”—“Dreamgirl”—“The Maker” combo) a nearly 23 minute version of the classic “Seek Up” totally got the crowd back into it. The signature dark instrumental intro, followed by what seemed to be the entire stadium backing up Dave for the opening line “Sometimes I feel like I’m falling…” was eerie and awesome…and quintessential DMB. The crowd went nuts when Stefan’s bass solo led into the opening bars of “Crush,” but the high point was definitely the outro, when the whole band got lost in the music…when solos segue into all band jams and as a fan, you realize that one player is more impressively talented than the other. LeRoi and Rashawn definitely get to show their chops during this tune, trading solo time back and forth between sax and trumpet. You know the band is having a great time (and subsequently so are the fans) when Dave steps out from behind the mike and dances around the stage, guitar in hand and legs going crazy. Even more than “Angry Dave,” “Dancing Dave” is something every fan hopes to see when at a show! The high energy, jamming, dancing and improv Dave lyrics continued with “Stay,” particularly again during the outro. Amazing way to end the set and rile up the crowd for the encore! Finally, anyone who doubts that Carter Beauford is the best drummer EVER has never seen/heard his solo during a “Two Step” finale. Seriously, the guy must have more than two arms! This was definitely his song of the night…and it’s cool if you can catch him give a nod and of course a smile (as he’s also the happiest drummer in the business) to the rest of the band, indicating that it’s time for them to join back in to finish the song with a bang. I also loved the quicker paced intro where Dave teased the crowd a few times before the whole band busted into the song. 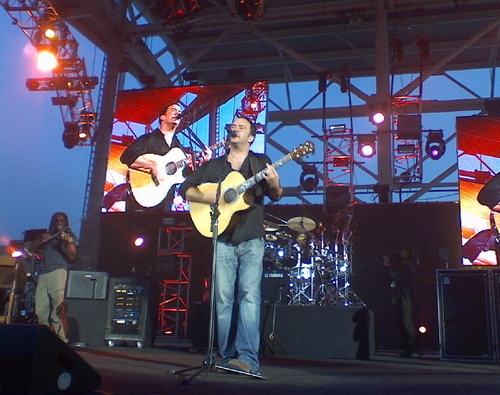 As always, I left this DMB show smiling ear to ear, anxious for my next one…Hint, hint: Billboard! Finally, I can’t end this blog without giving a shout out to the absolutely awesome group of DMB fans I got to hang out with this weekend. You all made my trip to Chicago and this first DMB show of the season one of the best. Though I usually hit the shows with my core group of concert buddies, it was so cool to meet fellow die hard fans from all over the country, and even Canada! Props to Frank for being the ultimate DMB host, organizer, tour guide, party planner, etc. You rock! Wayne, may you never eat another salad without thinking of me. Jay, Reid, Celeste, Taryn, Casey, Debbie, Jodi and anyone else I might have missed…see you on the east coast in August! And of course to Ross…thanks for your support. You survived a weekend of DMB! 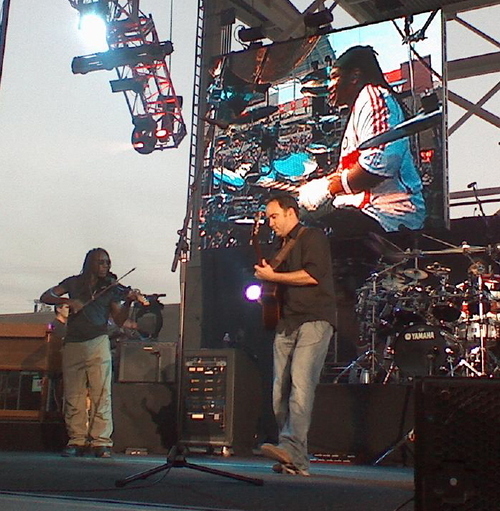 Although I'm just a "supporter" it was indeed a great show and alot of fun hangin' with the DMB crew. You couldn't have described the concert any better. On to the next one! "One of the best parts of a DMB show is seeing (and hearing) how intensely Dave can get into a song, and “DDTW” is a great example of this." - SO TRUE! Love DDTW!! Your blog just brought the BIGGEST SMILE to my face. Spending the weekend with you all and sharing this show with you is what made it all worth while! And seeing your head pop up with your little LG was hilarious and I was proud to be screaming for you!!! You rock Leslie!! And hahaha Idea of You about his babysitter, love it!! great pics and tour time is here! Great description! The engery that night was incredible. Nice Review!! The boys were on that night! Its great to read a review by a real fan! Nice pics! whoo! nice blog entry. i agree with some of the sentiments you delineated. the album however is called stand up, not american baby. sounds fantastic! one of these days i'll ante up the cash to go see these guys. speaking of concerts, you should come out to detroit to see built to spill on 7/16. st. andrew's hall will be an amazing venue to see them at. Awesome photos, I love them. Looks like the show was great, neat blog too. I look forward to more. Long Live the Matthews Band. Great pics! Nothing better than great seats at a great show. glad you had fun. OSW was a nice opener with the beautiful, but hot, weather we had in chicago. Great blog and review. Glad you were able to not only enjoy the show but also the fellow fans, thats always the best part. Nice review, had a great time at the show! spot on review. well done. Leslie! What an amazing review... brought such a huge smile to my face! those are some great pics! i couldn't have summarized the evening any better. We had so much fun cheering you on every time ur head popped up on the gate. it was great to meet you and Ross this weekend. hope to see you again soon! Nice review. Glad you enjoyed.